This is an impressive collection of photographic portraits of individual Native Americans dating from about 1898 and identified with their names and tribal affiliations. 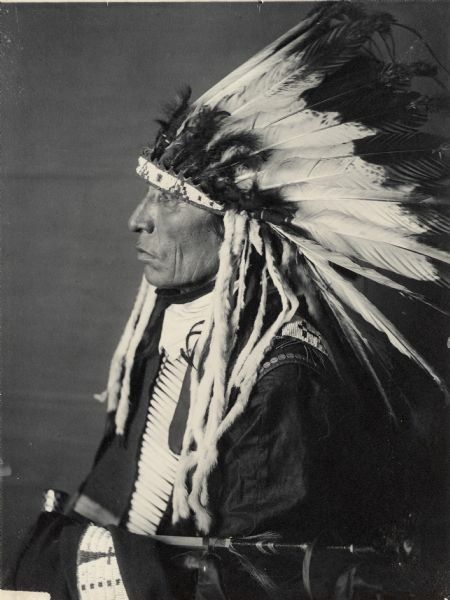 De Lancey W. Gill was the last — and most prolific — of about a dozen photographers who worked with Native Americans for the Smithsonian's Bureau of American Ethnology (BAE). Between the 1850s and the 1930s, many tribal leaders went to Washington, D.C., to meet with government officials, providing an excellent opportunity to make a visual record of them in a systematic way. The images are all contact prints, made using the high-quality platinotype (platinum) process, which results in very "expressive" images due to its long tonal range. The original negatives are held by the Smithsonian Institution. Gill was a watercolor painter of some note before he began working in 1884 as an artist for the U.S. Geological Survey. In 1889 he became the chief of the USGS illustrations section, mainly directing draftsmen and photographers, and planning and editing publications. It was not until then that he made his first foray into photography, only because, he said, there was no one else to do the work. But he had a natural talent for it. Until his retirement in 1932 at age 73, Gill took between 2,000 and 3,000 individual and group portraits, some during anthropological expeditions to Virginia, Arizona, New Mexico and northwestern Mexico. Along with the other BAE photographers, he left an outstanding record of Native American citizens and their clothing, highlighting the dignity and personal presence of each.